The city of New Angeles offers many opportunities to those that live there. You can specialize in just about anything, and find jobs in all manner of exciting careers. That's what you get a look at in this preview of the upcoming Shadow of the Beanstalk sourcebook for Android, part of Fantasy Flight's Genesys RPG system. Having more resources at your fingertips is never a bad thing for a GM. For those playing the Genesys system from Fantasy Flight, and specifically the Shadow of the Beanstalk version in the Android universe, you'll want to check out the three new upcoming Adversary Decks that will be hitting shelves soon. They're packed with NPCs that you can instantly add to any game. While NetRunner might be no longer a game that Fantasy Flight will be making, that doesn't mean that their Android universe is coming to an end. The sci-fi world will live on in Shadow of the Beanstalk, a sourcebook for their Genesys RPG system. Fantasy Flight is showing off a preview over on their website. There's never enough possible resources for a GM, if you ask me. They have a lot to keep track of and plan for, so if there's a thing that'll make that easier, I'm all for it. If you're playing the Genesys RPG and are using the Realms of Terrinoth setting, you'll want to check out these new Adversary Decks from Fantasy Flight. They're full of NPCs that your group can come across, with all the stats you need for them right there on the card. You've gone into the world of Terrinoth via a couple board games and a kinda-RPG, but if you've really wanted to go all-in and immerse yourself in that fantasy realm, you've not had a way... until now. 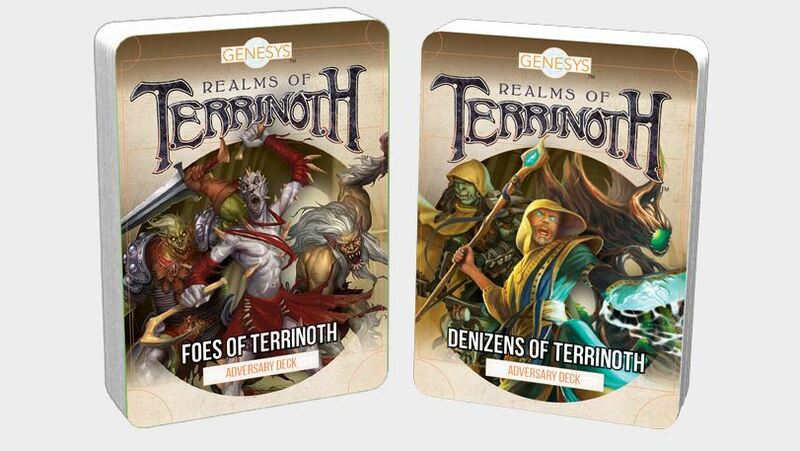 The Realms of Terrinoth sourcebook for the Genesys RPG is now available from Fantasy Flight Games. Game worlds are not just right where the PCs are. There's all manner of things going on all over. And when the players go to new locations, the GM has to be ready for what the terrain is like, what the map shows, and some people who live there. That's what we get a look at in this preview of the upcoming Realms of Terrinoth book from Fantasy Flight Games. Fantasy Flight Games gives you lots of different ways to experience the Terrinoth setting. They've got Runewars. They've got Runebound. They've got Legacy of Dragonholt. Soon, you'll have yet another way to get involved. They'll be releasing the Realms of Terrinoth book for their Genesys RPG system. In this preview, see what you'll be able to do that makes your characters stand out from all the other people of the world. The Genesys RPG system is built to handle any setting and style of game you want to run in. But that's not to say that once you've got the base book, you're fully done. Sure, if you want to make up all your different realms entirely from scratch, you can do that. But having setting books would certainly help. And Fantasy Flight has announced the first one. It takes you the world of Runewars and Runebound with the Realms of Terrinoth. Most RPG systems are very specific to a time or place. Medieval fantasy. Interstellar sci-fi. Pulp-noir Earth. The Genesys system isn't like that. This new set of rules gives you the ability to play anywhere, anytime, anytheme. It's now available from Fantasy Flight. No, the headline doesn't mean that we're taking a look at the different bardic classes in the game. Here, tone refers to how the game comes across for players. Is it light-hearted and comedic? Is it dark and brooding? Is it gritty? When a system says that it's universal, it should be able to cater to all of these. But how does the game go about doing such? Well, take a look. The Genesys RPG coming from Fantasy Flight Games can be used for any realm, any setting, any era, any location, any... anything, really. But with that blank canvass to start out with, it can be a bit to try and start with that first brush stroke. So... where do you begin? How does world-building happen in the game? Are you just expected to create everything from scratch? Not so, and in this preview, you get a look at what you're given to work with. Sure, when many people think of playing in an RPG, they think of heading down into the dungeon and smacking around some goblins or kobolds, grabbing the loot, and heading back to town, but what about when you do make it back to town? Or when you've got to get papers from the local nobility to travel across his lands? Or so many other situations that can't be solved with, "I swing my sword at it"? Social encounters are just as important as the combat ones (and are honestly some of my favorite parts of games). In this preview from Genesys, Fantasy Flight's upcoming RPG, we get a look at how these social encounters work within the rules. Versatility is good. Having one thing be able to do multiple things is just efficient. That's where the Genesys Role Playing Game comes in. Fantasy Flight Games has announced this new system, which utilizes their Narrative Dice mechanic. It's realm-free, meaning you can use it in your fantasy games, your sci-fi games, your historical games, your superhero games, your cartoon animals games... whatever you want.